Laura discusses making The Ballad of JT LeRoy with artist/filmmaker Lynn Hershman Leeman. Actor Andrew Rannells (“Girls”) speaks to Laura in this video interview — with music by West Coast beatmaster T Fiya! Actress Eloise Mumford (Fifty Shades of Grey) discusses her career and her commitment “to dispelling the notion that ‘other’ is bad or wrong” with Laura and ContentMode. Diane Pernet (A Shaded View On Fashion) makes scents: The fashion icon speaks to Laura and ContentMode about her new perfumes, fashion, and her celebrated international film festival. 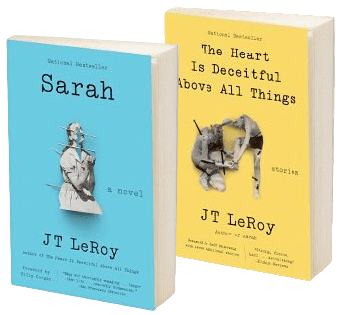 Master documentary filmmaker Jeff Feuerzeig, who made the landmark The Devil and Daniel Johnston, has turned his attention to Laura Albert and JT LeRoy with his new film Author: The JT LeRoy Story. Watch the movie Author: The JT LeRoy Story here.